Shabbethaian agitator of the seventeenth century; a native of Morea. 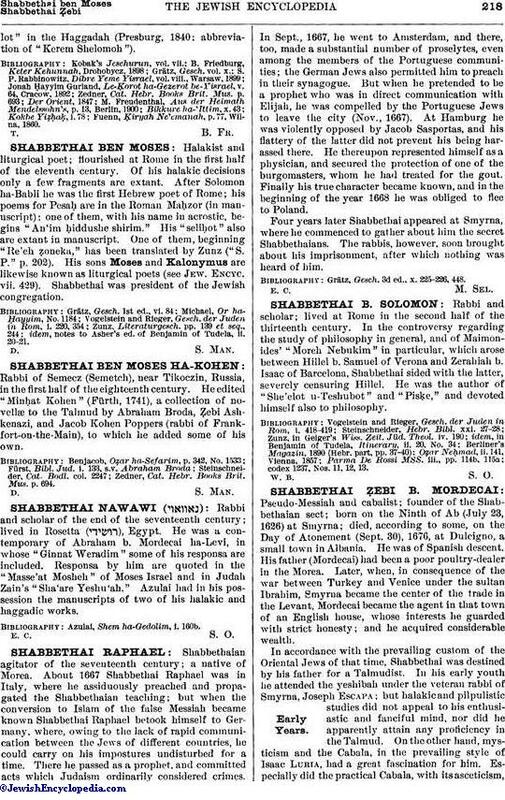 About 1667 Shabbethai Raphael was in Italy, where he assiduously preached and propagated the Shabbethaian teaching; but when the conversion to Islam of the false Messiah became known Shabbethai Raphael betook himself to Germany, where, owing to the lack of rapid communication between the Jews of different countries, he could carry on his impostures undisturbed for a time. There he passed as a prophet, and committed acts which Judaism ordinarily considered crimes. In Sept., 1667, he went to Amsterdam, and there, too, made a substantial number of proselytes, even among the members of the Portuguese communities; the German Jews also permitted him to preach in their synagogue. But when he pretended to be a prophet who was in direct communication with Elijah, he was compelled by the Portuguese Jews to leave the city (Nov., 1667). At Hamburg he was violently opposed by Jacob Sasportas, and his flattery of the latter did not prevent his being harassed there. He thereupon represented himself as a physician, and secured the protection of one of the burgomasters, whom he had treated for the gout. Finally his true character became known, and in the beginning of the year 1668 he was obliged to flee to Poland. Four years later Shabbethai appeared at Smyrna, where he commenced to gather about him the secret Shabbethaians. The rabbis, however, soon brought about his imprisonment, after which nothing was heard of him. Grätz, Gesch. 3d ed., x. 225-226, 448.